Prepping the mung beans: Place the mung beans in a small saucepan. Cover with water and soak for 30 minutes. Drain, then barely cover with coconut milk and bring to a boil. Immediately lower the heat to medium-low, cover with a lid and slowly cook for 7-8 minutes until all the liquid is absorbed. Turn off the heat and set aside for at least 30 minutes. Place in a food processor and pulse until mealy. Wash and rinse the rice thoroughly in several water baths (about three times). Place in a large bowl, cover with cold water. Soak for at least 4 hours or preferably overnight. Drain as much water as possible. Combine the soaked rice and mung beans. Mix well. Form several rice balls, pressing firming. 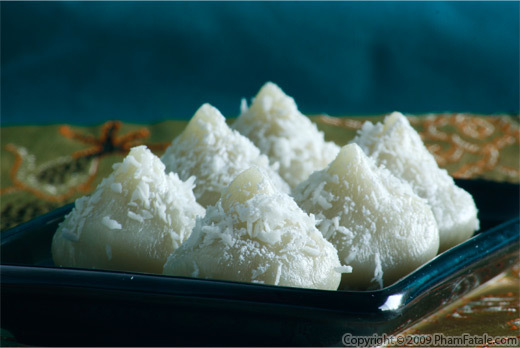 Line the basket of a steamer with cheesecloth and place the pandan leaf and the rice balls in it. Fill the steamer with water. Cover tightly. Bring the water to a boil and reduce the heat to medium-high. Cover and steam for about 20 minutes. The rice should be soft, shiny and on the dry side but still firm (not falling apart). Using a small pestle (or a knife handle or a chopstick), gently press the center of each ball and continue steaming for another 20-25 minutes. Delicately transfer the balls to a serving tray. Sprinkle each ball with sugar, to taste. 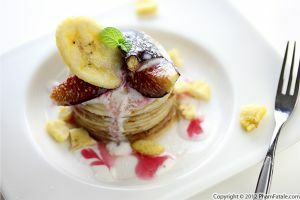 The steam will absorb the sugar. Gently mix. Let cool to room temperature. You could serve these with green tea. 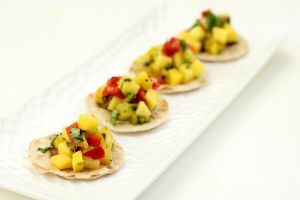 You could garnish the top with shredded coconut or coarsely chopped peanuts. 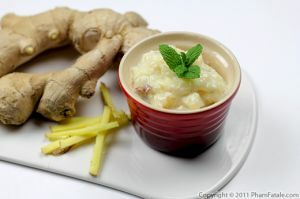 A pinch of salt brings out the flavor of the sticky rice dessert and enhances its sweetness. 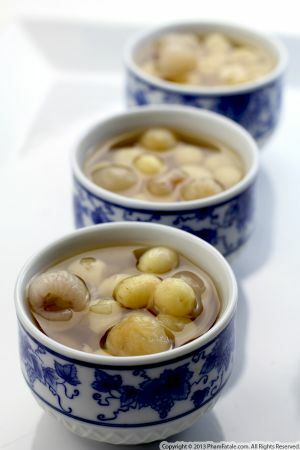 Cooked mung beans are a great binder and will stick easily to the rice to be able to form the rice balls. 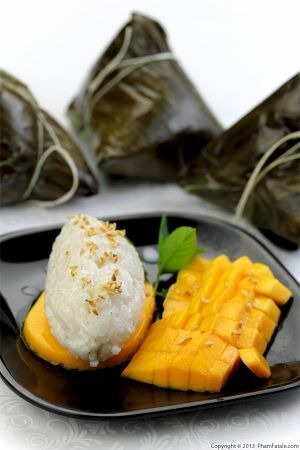 You can find delicious sweet sticky rice in any market. I used Kokuho Rose brand. 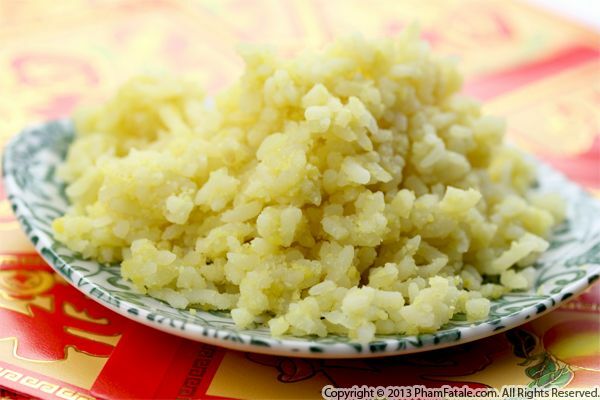 Depending on the glutinous rice you use, you might need more or less water. If the mixture is too watery, add more mung beans. If the dough is too dry, add more water. You can find all the ingredients listed above in most Asian markets. 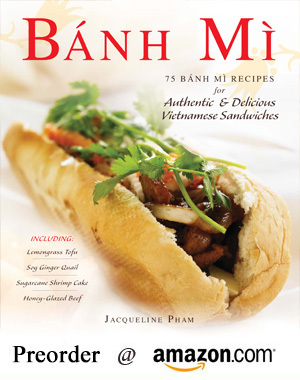 Published By: Jacqueline Pham on January 31, 2014.